Seems like a simple definition; yet, there is a lot to be said about gratitude. Much of the wellness and happiness in my life can be attributed to gratitude. Trust me, it will always be an evolving practice but the results are fascinating and very empowering. In fact, I think the quality of gratitude (in many facets) is really the key to self-discovery. From gratitude comes compassion for yourself and others; from gratitude wells credibility, positive energy and karma – these are the bridges to wellness and happiness! Over the last 10 years I have been slowly taking power away from my ego and false-self through continued mindfulness. It has been a gauged process with many triumphs and setbacks along the way. I am speaking for myself here, but I think we all tend to learn the hard way when it comes to life lessons. This road to self-discovery is long and challenging; and knowing this, we also should understand that life is not perfect and either are you and I; ….and trust me; I am okay with that notion…. Still, through the pitfalls and successes, a measurable quality of passive narcissism and shallow self-confidence has been disappearing from my actions and reactions. Again, it took time, but I am far more mindful and aware than I was a decade ago. Proof tends to be in the experience. As an example, the materialistic things that pleased me years ago no longer govern my happiness and wellness today. I am more reverent for what I have and not what I don’t have. This change in personal philosophy is a defining benchmark in my life as I continue to walk toward the light. 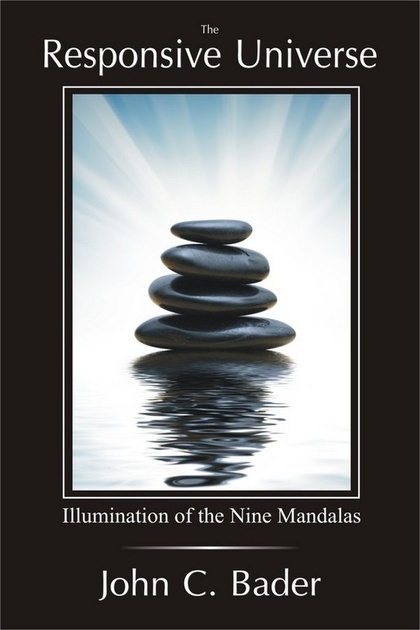 We all gain our energy from inward and outward qualities. Energy is gained by how we interact with others in society and our environment. This energy can be positive or negative depending on its source and our most basic perceived and conditioned needs. When we react through ego (many times unknowingly), we care what other people think and base our self-esteem on elements in life that are not fixed or permanent (like money, objects and effluent friends). The common result is suffering. Yet, when we exhibit all facets of gratitude in our lives, there is only room for true authentic energy and dynamism to spring forth. Every act of gratitude is projected out into this Responsive Universe; only to return as positive energy and karma. Every act of gratitude pushes the ego and its influences farther away from intention – the result is genuine, clear concise actions in life that allow us to live under the warm and healing illumination of self-discovery. 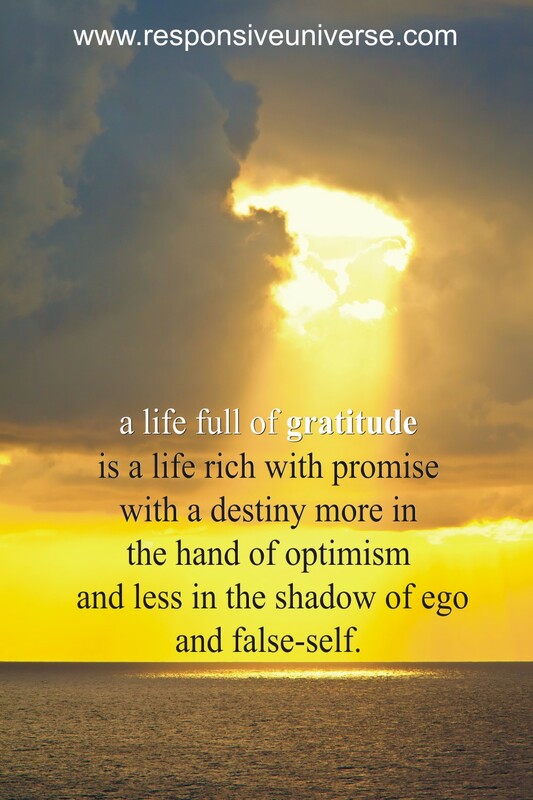 …but a life full of gratitude is a life rich with promise with a destiny more in the hand of optimism and less in the shadow of ego and false-self.